Fun fact: I used to mock smoothie bowls. I also used to mock all of those “boosting” juices from trendy juice bars. And yet here I am—with a green smoothie bowl that boasts all of the nutritious zippy flavors you’ll find at a juice bar, thanks to the addition of broccoli rabe. I’ve always been keen on smoothies. But for the longest time, in my mind, they were made to be sipped. Not spooned. However, when you bring your smoothie to a bowl, you get to add extra goodies to it. Like crunchy nuts, healthful seeds, and hunks of juicy fruit. I don’t know why it took me so long to realize that a smoothie bowl is oh-so-much more than just a fancy photo op—and I’m glad I’ve moved past it! Because this cool and nourishing beauty has become a regular at my breakfast table; just in time for the dog days of the North Carolina summer. Broccoli Rabe’s got what you need. We see kale smoothies everywhere, but I think broccoli rabe deserves more love because it too is a powerful cape-clad superhero in the land of food. It’s immune boosting. Just 3.5 oz of this good stuff gives you 50% of your daily value of vitamins A and C. It also helps to detoxify the liver due to its sulphur content. It strengthens your bones. By adding 1/2 a cup of broccoli rabe to your meals—which is easy to do—you’re getting 100% of the recommended daily dose of vitamin K.
It improves your eyesight. Carrots ain’t got nothin’ on these leafy greens with their hefty punch of lutein, which aids in protecting the retinas in your eyes from damaging free radicals. It’s heart-healthy. I’m all about the heart-healthy foods here, and broccoli rabe shines bright with its large quantity of anti-inflammatory nutrients like folate and vitamin C.
It’s good for your gut. Each cup contains 2 grams of soluble and insoluble fiber. And as a bonus! It’s fantastic on flatbread pizza. Keeping your smoothie on the healthy side. Smoothies don’t automatically result in a healthy breakfast. It seems like they should, since we’re skipping that glorious cream cheese-smothered bagel for a jumble of fruits and greens, but if you aren’t careful, healthy intentions can turn into a sugar-packed mess. And fast. Another misconception is that if you’re using a natural sweetener, like honey, agave syrup, or dates, you’re avoiding that whole “too much sugar” thing. But! Since the fruits you’re adding to your blend act as natural sweeteners, you want to make sure you’re balancing things out properly. A good way to keep track is to only add one cup of fruit per serving. This is why one serving of this smoothie calls for 1/2 of each fruit, all equating to about a cup when chopped up. Save the other halves for the next day or use a few extra pieces for topping your bowl. When it comes to topping your bowl, try not to go overboard. A lot of jaw-dropping smoothie bowl photos incorporate mounds of nuts, fruits, and granola scattered on top. Are they gorgeous? Heck yes. But be mindful of what’s already going on in your blend. I kept things simple here with half of one strawberry, a little bit of mango, a smidgen of dragonfruit, a sprinkle of chia, and a few pepitas for a bit of crunch. This bright and healthy green smoothie bowl is jam-packed with broccoli rabe and tropical fruits like banana, mango, kiwi, and unsweetened shredded coconut. 2 cups roughly chopped broccoli rabe you can use the leaves and florets. Place all ingredients, from the banana to the coconut water, into a high power blender. Blend the ingredients on high powder until the mixture is smooth. If you'd like a more chilled smoothie, add a handful of ice and blend it until smooth. Pour the smoothie into a bowl, and top with your choice of sliced fruits. See the recipe notes for suggestions and a list of what I used. You can add a few slices of extra fruit fro your smoothie, or any fruit you have kicking around your kitchen. Fruit can be sliced, diced, scooped using a melon scoop, or sliced and shaped using little cutouts as seen with my bowl. For my bowl, I used a few strawberry slices, mango slices, some dragonfruit, about 1 tsp of pepitas, and a sprinkle of chia seeds. Feel free to to yours however you'd like. Get creative! I love broccoli rabe, but never knew of its eye benefits! That's fantastic. I've been doing something good for my eyes, and didn't even realize it. What a great idea to incorporate broccoli rabe into a vibrant smoothie bowl. That color is incredible! I can sometimes get in a breakfast rut, but a creative bowl like this would definitely get me excited for the mornings. Well isn't this just beautiful!! I am pretty sure I have added every green to my smoothies except broccoli rabe, but now I MUST try it out. This sounds amazing, and I love that it doesn't include too much of the sweet stuff, because that is one thing I am trying to cut down on. Can't wait to try this out. I was so anti-smoothie bowls too, but then I realized I always make my smoothies thick and I love to eat them with a spoon. So, basically, a smoothie bowl. D'uh. I have never ever had broccoli rabe in a smoothie but I LOVE it in savory dishes so I can't wait to try this slightly sweet bowl out. Looks great! I love your gif! Good call on the fruit serving though - all the IG smoothie bowls loooooaded with all the fruit toppings always amaze me because I don't even eat that much fruit in a DAY but somehow they have it all for breakfast? That's a sugar high I don't think I'm ready for. This is why I love adding greens to smoothies like you did here - it adds a little more to the smoothie and cuts down on the fruit needed for flavouring. WOW!! I'm like you, I've been pooh-poohing smoothies for the longest time. I'd say to myself, #Good grief, how hard is it to throw something in a blender and post?" But I like the idea of a bowl. I think eating it like soup you go slower and appreciate it more. I love the little fruit cut-outs on top. That is such a great idea!! This is so pretty, and such a fun color! I don't think I would have thought to put broccoli rabe into a breakfast dish. Love the fruits in this too, and it sounds like such a filling way to start out a day. I'm so glad you talked about the "danger" of all the beautiful toppings. I see those gorgeous smoothie bowls on instagram and the only thing going through my mind is - that is a whole day of calories in one bowl - with all the nuts and nut butters and bananas on top. Your smoothie bowl looks just as gorgeous as those IG ones if not even more beautiful but it's true to what its supposed to represent - healthy eating! I love broccoli rabe (and that's the brand I usually get here) but I've never added it to smoothies. Also - really cool video/gif! Andy Boy's broccoli rabe is GORGEOUS! I love finding it at Whole Foods. And your smoothie bowl looks fab! I definitely agree that smoothies can get too sugary (and too fatty), but this one looks perfect. I'm super jealous of your dragonfruit too- I can't find it here! What a fabulous idea to use broccoli rabe instead of kale! And I totally agree- smoothies can be a total sugar-fest lol. (And sometimes fattening with all the nuts.) But done right- they're amazing. This one looks awesome, and I'm jealous that you can find dragon fruit! What a delicious smoothie bowl. I have only used broccoli rabe a couple of times, but never this way. With fresh berry season here....toppings are endless. Perfect for breakfast or lunch. Great hot weather eating. I agree that there is a lot of hidden sugar in a smoothie -- my daughter didn't believe me when I warned her of how caloric they could be -- and then she looked at the calorie count at Jamba Juice and she was shocked. Some are more than a meal. Good tips on keeping the serving within a normal range. BTW - I've always looked at smoothie bowls as photo ops too, LOL! Yours is gorgeous. 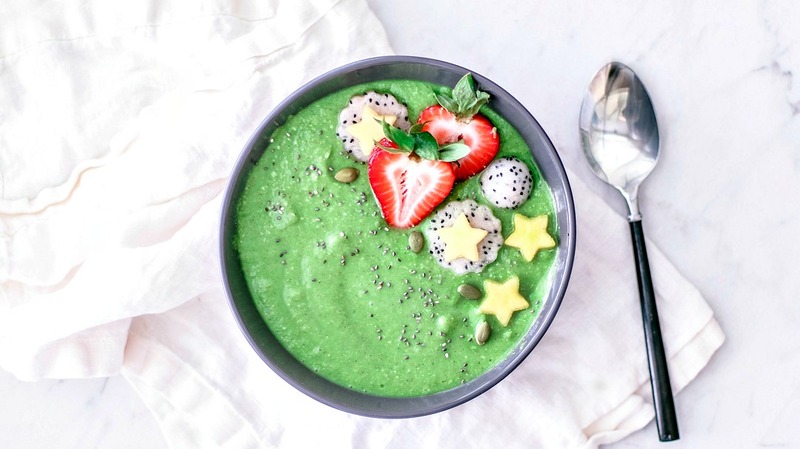 Have you ever tried making a smoothie bowl with matcha before? I've made it a few times and it's amazing!